Melink provides energy solutions for companies like Walmart and Hilton. A windmill is one of many green elements at Melink's corporate headquarters, one of the greenest buildings in the U.S. 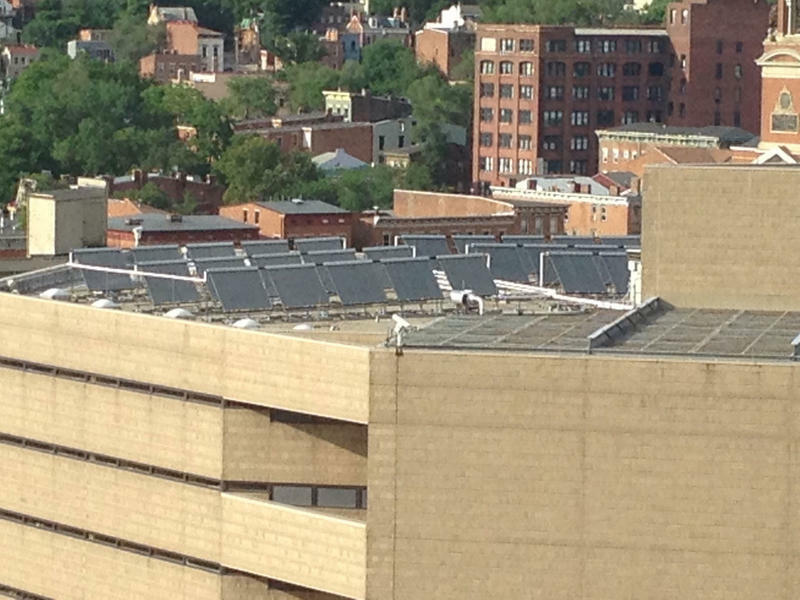 Solar panels are on the ground and on the roof at Melink. Many of the people who work at Melink drive electric cars. Melink is in Milford, off Roundbottom Rd. President Steve Melink speaks to the Ukranian delegation. The visitors look at a dashboard, showing how much energy Melink is using. Biomass stoves are used to heat Melink. This are the wood pellets for the biomass stove. A picture shows the Melink campus. This solar-thermal system heats the water for Melink. WVXU accompanied members as they visited the Melink Corporation, which sells its clean energy solutions to customers like Walmart and the Cincinnati Zoo. At its Milford corporate headquarters, Melink Vice President of Solar Business Development Jeremy Chapman led the Ukrainians into the kitchen. He asked them, "Did anybody notice what didn't happen?" A translator answered after conferring with the group, "The lights didn't turn on." Chapman said dual sensors determined there was enough natural light that the lights didn't need to come on. Light sensors are just a small part of Steve Melink's corporate building in Milford which features electric car plug-ins, biomass stoves and solar panels. President Steve Melink wants the delegation to push the envelope. "I think they are assuming that they may not have enough solar irradiants, but if Germany can be the largest market in the world for solar, I think Ukraine has a chance to be a decent market." The manager of Kharkiv's municipal assets, through a translator, said there are challenges. "The major problem is disruption of economic ties with Russia. And as far as our partnership with the European Union, they're looking for ways to make it happen." Jeremy Chapman asked everyone to stand in a stairwell at Melink to get a better look at the building's solar-thermal system, which heats potable water. On a day when temperatures reach only the single digits, Chapman told the visitors it will heat up to 220 degrees. During their week in Cincinnati the group was also scheduled to go to the Cincinnati Water Works, the Rumpke Recycling Center, Duke Energy's Envision Center, the UC power plant, the Cincinnati Zoo, Quasar Energy, and SOA Energy Engineers. The Ukrainians say they will propose some of these ideas back home.